We've moved the blog from Typepad over to Wordpress. You can find it now at blog.jenis.com. All of the original content from this blog will continue to live on here at jenisplendid.typepad.com. Above: organic, fair trade-certified vanilla beans from Uganda's Ndali Estate. When it comes to making vanilla ice cream you have a few choices: use artificial vanilla flavoring, use vanilla grown in Madagascar (which produces most of the world's vanilla), or use something extraordinary. In Uganda Ndali Estate cultivates what we consider the finest organic vanilla on the planet. Since 2007 we've used Ndali Estate vanilla to make Ugandan Vanilla Bean ice cream, and now we use Ndali Estate vanilla in any ice cream that calls for vanilla. Why? Flavor and aroma. The real thing, the labor-intensive thing that requires pollination by hand and nine months on the vine to ripen, packs a knockout punch. BBC Radio 4 recently traveled to Uganda to report from the fields of Ndali Estate (the first-ever fair trade-certified vanilla farm in the world) to shine light on the growing market for extraordinary vanilla. It's a fascinating story of the crop and a peek into the lives of the men and women who cultivate, harvest, and process one of our key ingredients. In addition to Farm Aid next month in Hershey, Penn., we have some delicious travel plans on the horizon. Dead ahead: a full slate of scooping events in New York, beginning with Meatopia on Saturday. Founded by omnivore extraordinaire Josh Ozerksy, the festival of meats prepared by chefs from around the world will take place on Randall's Island. "Meat*Drink*Fire*Music" is the motto and we can't wait to be a part of something The New Yorker called "a carnivorous bacchanal." We're expecting to face a crowd of more than 3,500 hungry people, and our Mobile Dipping Division will be ready to scoop and serve all comers. On our menu: Yazoo Sue with Rosemary Bar Nuts ice cream (pic below) and Rainbow Frozen Yogurt. The former—a limited-edition, nut-jammed number available soon in our scoop shops and jenis.com—is a collaboration with the great Yazoo Brewing Company, which is near our East Nashville shop. The latter, an eye-popping, super-creamy, and tangy Meatopia exclusive, features Raspberry, Lemon, and Passion Fruit frozen yogurts. Meatopia, an eater's eden in N.Y.C.—sounds like the only place to be on a Saturday in September. Above: Yazoo Sue with Rosemary Bar Nuts ice cream—where Yazoo Brewing Company's smoked porter beer, Snowville Creamery's grass-grazed cream, and fistfulls of mixed nuts (roasted with rosemary, brown sugar, salt, and cayenne in our kitchen) become one. Going to be at Meatopia? Be sure to step up and get a scoop. Above: A Thing Called Divine Fits, the new album featuring Like Ice Cream. Given that our business is ice cream, we pay attention to everything that deals with our reason of being. Dead center today is the sweet new tune Like Ice Cream by Divine Fits, a trio featuring Britt Daniel (of Spoon), Dan Boeckner (of Wolf Parade and Handsome Furs), and Columbus' own Sam Brown (New Bomb Turks). As catchy as catchy can be and sunny but not blindingly so, Like Ice Cream is part of the band's great debut album, A Thing Called Divine Fits, which is out today and in heavy rotation here at Jeni's headquarters. Check out the NPR piece about Divine Fits here, check out a recent live version of Like Ice Cream below, and if the band comes to your town, get out there and say hello to our friend the drummer for us. Above: Divine Fits' sweet tune, Like Ice Cream, live in Austin, Texas. Above: A scoop of Claudio Cantaloupe ice cream, a new flavor available only in our scoop shops. We have lots of flavors for you to taste this weekend in our shops, including the new Claudio Cantaloupe ice cream. Beginning today, we've added a small batch of the great Claudio Cantaloupe only to our dipping cabinets (supplies are very limited; pints are not available in shops or at jenis.com). A delicious, buttery, velvety, and floral blend of cantaloupe, sweet Ohio grass-grazed cream, and Ohio wildflower honey (and a few other ingredients we'll get to below), Claudio Cantaloupe is a throwback to the early days of Jeni's Splendid Ice Creams when Jeni herself made every flavor, every day behind the counter in the North Market. Back then, a sweet customer named Claudio used to tout Jeni's cantaloupe ice cream as Jeni's best performance and his hands-down favorite flavor. Jeni, nothing if not in tune with the feedback of the fans, named the ice cream Claudio Cantaloupe. And Claudio? Word is he ran off to Italy to elope with his beloved. Above: The arrival of super-aromatic Ohio cantaloupes. Above: Cantaloupes drying after a bath in the cleansing vinegar solution we use to kill any bacteria. Above: The great halving of the melons. Above: Line 'em up, scoop 'em out. Above: Straining before the boil. Above: Cantaloupe aboil with sugar, sea salt, Ohio honey, and grass-grazed Ohio cream. Above: Claudio Cantaloupe ice cream. Available only in scoops, only in our shops (all of our shops) in Ohio and Tennessee. Above: Jeni's personal sample distribution center/book-signing headquarters, soon to be on tour in Ohio. Here in Ohio, Jeni is set to participate in a number of great home-state happenings, including the fabulous Mint Fest Sunday afternoon at Jorgensen Farms. Have a question about a recipe? Crave a sample of ice cream? Want to have your copy of Jeni's Splendid Ice Creams at Home autographed? Come on out any and all of the events. Jeni would love to meet you and share some ice cream. What: Jeni's Backyard Mint Fest at Jorgensen Farms in Westerville. When: 2 p.m. to 5 p.m. Sun. Aug. 26. During an afternoon of great family fun down on the organic farm, Jeni will show you how to make peppermint-infused chocolate milk and peppermint-infused whipped cream. Read more about the super-cool fest — and Val Jorgensen, who grows the peppermint we use in our Backyard Mint ice cream. When: 7 p.m. to 9 p.m. Wednesday Sept. 5. Tickets: Free and available at U.A. Pub. Library; you must have a ticket to attend. Come out, enjoy some ice cream, and listen to Jeni talk about writing the first drafts of Jeni's Splendid Ice Creams at Home in the U.A. Library in early 2010. What: Country Living Fair at Ohio Village (at the Ohio Historical Society). When: 1 p.m. to 3 p.m. Friday Sept. 14. Tickets: $13 (one-day) and $15 (weekend—Sept. 14-16); $16/$20 at the gate. Info here. During Country Living magazine's 5th-annual gathering of vendors and exhibitors antiques, vintage furnishings, crafts, gifts, and collectibles, learn how to make a pioneering new ice cream flavor, Chamomile Chardonnay and pick up a copy of Jeni's Splendid Ice Creams at Home (or bring your own) and have it signed by Jeni. What: Cooking class at Sur la Table, Easton Town Center. When: 11 a.m. to 1 p.m. Saturday Oct. 6. Tickets: $69 at Sur la Table. Meet Jeni and learn how to make ice creams with the perfect balance of taste, texture, consistency, and finish. What: CSG Jubilee! at Columbus School for Girls. When: 10 a.m. to noon. Saturday Oct. 13. During the school's annual shop-a-thon/fundraiser, Jeni give a breif talk, answer questions, and sign copies of Jeni's Splendid Ice Creams at Home. It's a great way to do your holiday shopping early while raising money for the Columbus School for Girls Scholars Fund. What: Book signing at Walt Churchill’s Market, Maumee. When: Noon to 4 p.m. Saturday Oct. 20. At the superb Toledo-area gourmet grocery store, have samples of the good stuff, meet Jeni, ask questions about recipes, and go home with your signed copy of Jeni's Splendid Ice Creams at Home. Join Jeni and nearly 100 Ohio-bred authors and illustrators during the long-running book sale and autograph session. Looking for a way to beat the heat and have one last family outing before school starts back up? On Sunday, August 26th, we're partnering with our good friend and longtime mint supplier Val Jorgensen to give summer a proper send-off with Backyard Mint Fest at Jorgensen Farms. Val has a 65-acre organic farm in Plain Township (between Westerville and New Albany; about 30 minutes outside of town) where, among other things, she grows the Robert Mitchum peppermint for our Backyard Mint ice cream. There'll be plenty of activities to keep youngsters happy/busy—a farm animal petting zoo, hayrides, yard games, etc—plenty of good eats, and Jeni will be on hand to demonstrate how to make peppermint-infused whipped cream, as well as peppermint chocolate milk. YUM! WHEN: Sunday, August 26, 2:00 p.m. to 5:00 p.m.
Buy tickets here or at the Jorgensen Farms booth at the New Albany Farmers Market. 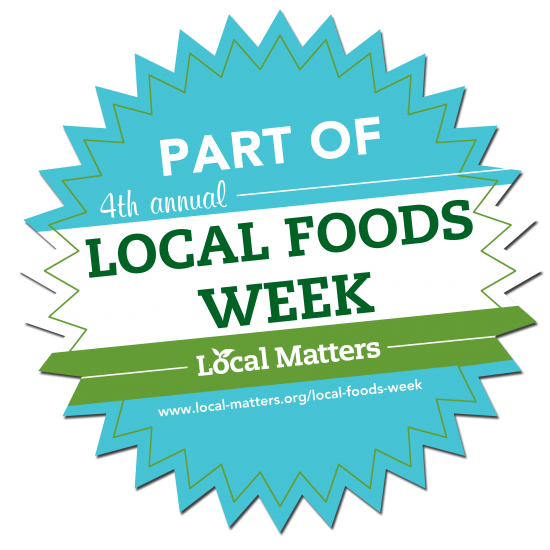 Local Foods Week starts tomorrow—4th annual, can you believe it?—and there's about a month's worth of delicious, food-related fun packed into eight days. You can find the full schedule of events here. The official kickoff for the week is tomorrow at Hills Market from 10 a.m. to 5 p.m. There's a foodie spelling bee, a kids cookoff challenge, a grilled cheese throwdown, a live auction—and more. The Jeni's Street Treats truck will be on the scene at Hills from 10:00 to 2:00 p.m. And during the live auction at 4:00, you'll have the chance to win an ice cream party for 100 of your closest friends, plus six pints shipped to anyone you want, anywhere in the good old U. S. of A.
Additionally, all day tomorrow (only), all proceeds from sales of the Famers' Market Sundae at our scoop shops will go straight to Local Matters. And then next Saturday (8/18), the Street Treats truck will be at the Godman Guild to cool you off at the final stop of the Urban Garden Bike Tour and Picnic. Above: Jeni during a samples-and-signing session in Bristol Farms/Pasadena, part of a recent tour of Bristol Farms and Gelson's shops in L.A. See more photos in and around L.A. here and read about the photographer who made them here. There's a new three-part Masters Series post up on foodandwine.com where Jeni shares the techniques we use in our kitchen, tips for making, scooping, and eating ice cream, and her favorite ice cream spots in the world.